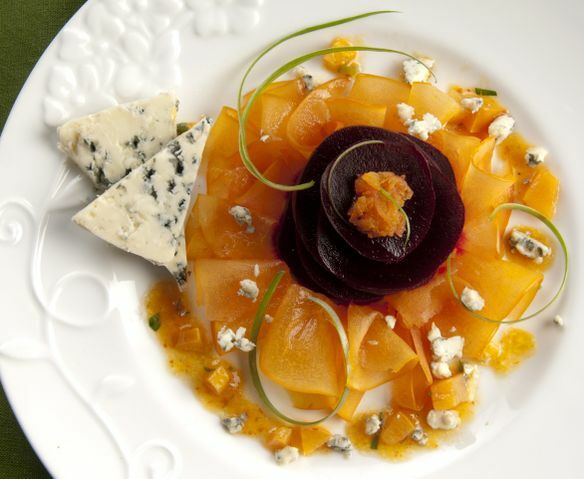 Persimmon Salad with Beets & Bleu Cheese. Photo copyright Carl Kravats 2012. This is a quick and easy salad that has autumn all over it. Whisk together all ingredients. Let sit at room temperature for a few minutes for the flavors to meld. Remove the garlic clove before using. Remove calyx from persimmons. Using a mandolin or a sharp vegetable peeler, cut the persimmon into paper fine rounds. Slice beets into rounds. Slice scallions vertically into thin strips. Plate beets in center of plate and surround with persimmon slices. Top with Bleu cheese crumbles. Drizzle dressing over salad. Garnish with scallions and Bleu cheese wedges. It's also excellent served with sugar spiced pecans or walnuts.